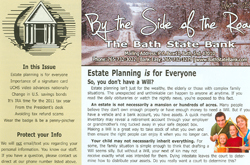 Customers and shareholders of Bath State Bank receive our quarterly newsletter, By The Side of the Road. The publication contains banking news, products and services, regulatory issues, announcements in Bath, recipes, savings and security tips and much more. If you would like a complimentary copy, please call us.